Celebrating the pending release of "The Passing" and the Left 4 Dead 1 and Left 4 Dead 2 teams colliding, we have a few other world colliding events to announce. First up, the Midnight Riders collide with Rock Band. The gang over at Harmonix have released two Midnight Riders's songs for Rock Band! You can check them out here and download them in game to play in the comfort of your own home. "The Passing" will feature a brand new slow power ballad; "Save Me Some Sugar". What happens when a 1939 film classic collides with Left 4 Dead? Check out Agnostes' awesome Left 4 Dead campaign poster he made for a Wizard of Oz concept art contest to find out. 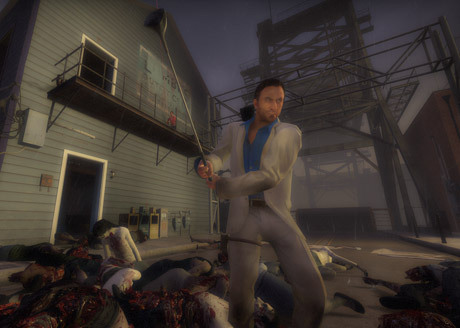 What happens when Half-Life 2: Episode one collides with Left 4 Dead 2? Mixmedia's City 17. Alyx would be proud. What about TF2 and L4D2 colliding? That would be Jsparakov's Badwater Basin map. And for worlds colliding into worlds colliding, check-out TF2's and Sam & Max's collision currently going on. So enough worlds colliding, when is "The Passing" coming out? Well... if it was coming out next week we would say right here - Left 4 Dead 2's The Passing is coming out next week and we will be updating the blog next week with more news on the release. There you go.